What more can you ask for!? 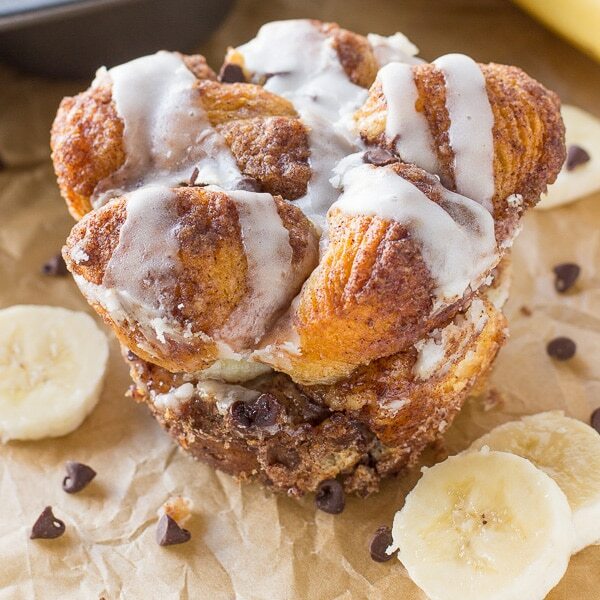 These Banana Monkey Bread Muffins have all your breakfast favorites in one scrumptious muffin. As always, these muffins are super simple to make and would be perfect for Christmas morning. ✓ WANT TO MAKE 12 STANDARD MUFFINS INSTEAD? : No problem, all you need to do is use 2 packages of Pillsbury Grand Flaky Layers Biscuit Dough and follow the rest of the recipe! 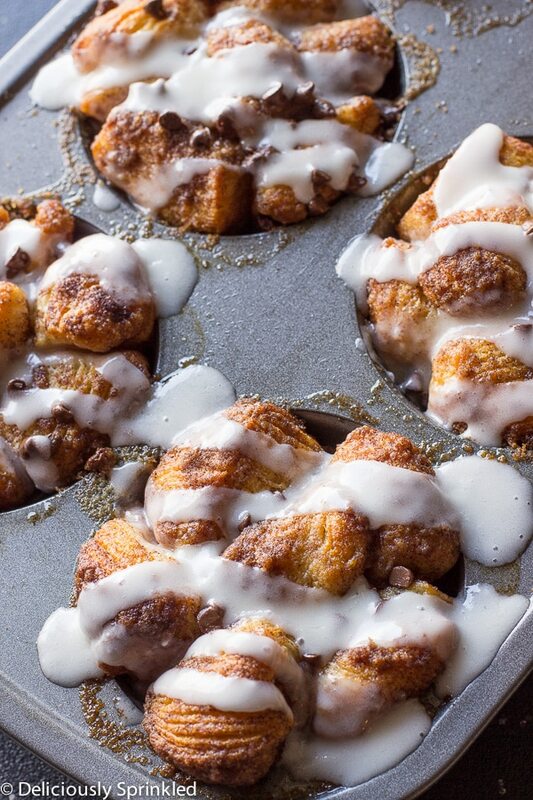 ✓ BEST THE DAY YOU MAKE THEM: These Banana Monkey Bread Muffins taste best the day you make them or the next day. ✓ WHY USE ONE BANANAS? : ONE Bananas focuses on ONE thing…growing high-quality bananas in a socially and environmentally responsible way.The balanced flavor and taste of our bananas is a result of being grown in the fertile and tropical microclimates of Guatemala, Peru and Ecuador where our farms are located, as well as the volcanic soil in these regions. Now you can see why they are the BEST! PRE-STEP: Preheat oven to 350F degrees. Spray a jumbo muffin pan with non-stick cooking spray. Set aside. STEP 1: Unroll tube of biscuit dough. Cut each of the 8 biscuits into 8 pieces. STEP 3: Combine melted butter and banana pudding mix. Stir until combined. Combine the brown sugar and cinnamon in a small bowl. Dunk each piece of dough into banana-butter mixture and roll into cinnamon-sugar mixture. STEP 4: Place 4-5 pieces of dough into each muffin cup. Top with three banana slices and mini chocolate chips. STEP 5: Then top each muffin cup with additional 7 pieces of dough. Sprinkle with more mini chocolate chips. Bake for 18-20 minutes or until the muffins begin to turn brown. STEP 6: In a small bowl, whisk together melted butter, powdered sugar and heavy whipping cream until smooth. Drizzle over muffins and enjoy. This post is sponsored by my friends at ONE Bananas. Wow, these muffins are like three treats in one! Obsessed . 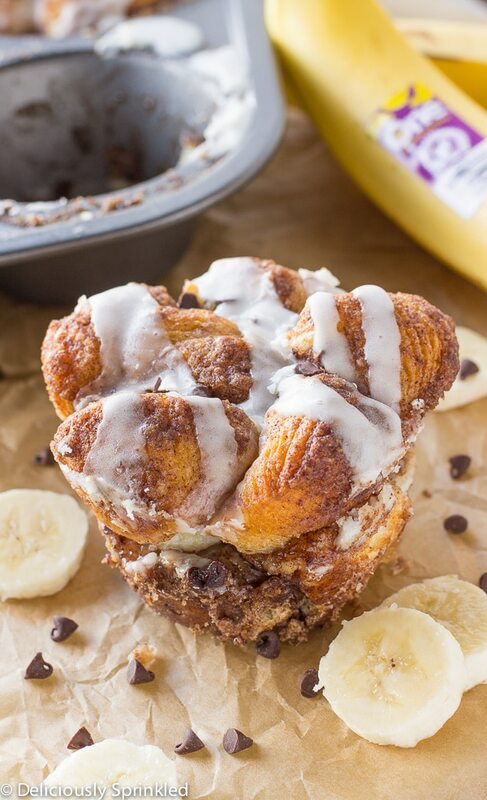 Ok, I am cracking up because I love that you added bananas to Monkey bread! Hilarious and tasty, two things I love in my life. I am definitely surprising my son with these on Christmas morning. Too fun!